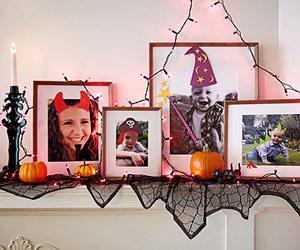 Instead of putting away your family photos to decorate for Halloween, why not dress them up for the occasion Parents.com used paper and putty to add costumes to the photos already on display. Such a fun way to simplify your holiday decorating...or undecorating this year. You can check out their costume ideas HERE.